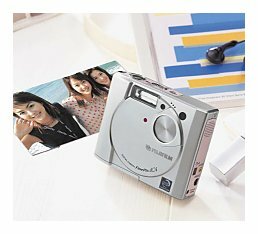 The FujiFilm 40i is a compact, pocketable digital camera with the added ability to playback MP3 music files. Encased in a smooth, all-metal case, the 40i can become a daily companion, enjoyable to use even when not taking any pictures. The FujiFilm 40i can playback MP3 music files that have been downloaded from the Internet or created from CDs and other audio sources with the included software. On a 128MB SmartMedia flash card, the 40i can store up to 2 hours of standard 128Kb/sec MP3 music files (or 140 minutes at 112Kb/sec and 160 minutes at 96Kb/sec). Naturally, music files share space with the pictures taken so you must leave some space free for pictures. Because the MP3 files are tagged to work only with the flash card it is being downloaded to to prevent duplication, you must use the small MP3 download program to load files onto the 40i. The included remote control attached in-line with the headphones (included, and you can use other headphones) and lets you control playback, volume, bass and track selection. It can be clipped to a shirt. Sound quality is very good with no audible noise. Playback time from the included rechargable Ni-Mh AA batteries is about three hours; an hour and a half on alkaline AAs. The inability of the 40i to FF/RW within a song during playback and the need to tag MP3 files during the transfer into the 40i are the major shortcomings. The 40i weighs 155g/5.5oz, lighter than all but the a small handful of the most compact, lightweight 35mm and digital cameras on the market today. At 86x71x29mm/3.4x2.8x1.1", the number of cameras that are smaller than the 40i are also but a small handful. Although the 40i is not as svelte as the Minolta X, the 40i remains quite easily shirt-pocketable and easily carried this way or around the neck. Unlike other more angular digital cameras that possess a rectangular, hard-edged shape, the 40i has a rounded all-metal body that is both very durable and comfortable to hold and pocket. An added benefit of the thick metal construction is the ability to withstand crushing and bending forces much better than flimsier digital cameras. Even when pocketed, you'll most likely be in pain well before the 40i bends or breaks when sitting down, but even so, it's not recommended that you actually attempt to sit on the 40i. Whereas most digital cameras today take several seconds to startup, zoom, focus, and switch modes, the 40i is far speedier due to a simpler non-zoom lens and smart optimization of the electronics. Even today, the 40i is among the fastest digital cameras to operate. Fewer than four seconds is needed to turn the camera on and take a picture, while many digicams take this long just to turn on! Complete covered with an automatically moving metal plate when off, the lens remains well within the front face of the 40i when on. For those looking for a camera that can be pocketed and used in tight spaces when on, the 40i can be counted as one of these cameras with no zoom snout to break or damage. Coupled with the fast timings of the 40i, this allows the 40i user to keep the camera on during eventful situations, always ready for a quick grab shot. The 40i can take short 80 second movie clips, filling a 128MB flash card with just over 12 minutes of movies. Movies can be easily emailed and viewed by others, athough Quicktime or MJPEG must be installed. A slow 10 frames per second and poor low-light sensitivity (too dark at night and indoors at night) are two downsides here. In summary, the FujiFilm 40i remains a solid buy at today's low prices for those looking for a pocketable, multimedia digital camera with a very durable metal body. The lack of a zoom snout to break off and quickness of operation benefits users that want to make quick grab shots at a moment's notice. Newer digital cameras such as the Minolta X and FujiFilm 30i and 50i models improve upon the 40i, so a quick comparison of features and price would be wise for any interested buyer, especially those interested in better low-light performance. + Simple to operate, quick operation, long battery life, good image quality in an easily gripped, compact body. + Colorful packaging makes for an inviting gift. Includes everything you need to begin taking pictures within 5 minutes of opening the box. + Continous mode takes up to four pictures at 2 frames per second. + LCD electronic viewfinder in addition to the LCD panel on the back. + Records short movie clips with audio and can be used as a webcam. + Sharp 6x zoom lens camera at an affordable price (~$350 USD). + Purchase a 64 or 128MB SmartMedia flash card to allow the 2800z to store 159 or 319 pictures in the default settings for longer trips. The included 16MB card can store 39 pictures. + Because the 2800z lasts so long on regular alkaline AA batteries, you may not want to purchase an Ni-Mh AA recharger kit, which runs about $20. A 40 pack of AAs can be found for about $15 and allows the 2800z to take approximately 10 (4 AAs) x 200 (shots per pair Fuji guidelines) = 2000 photos!